The researchers discovered that being in a group gives zebrafish a kind of “social buffering” so they are less afraid when confronted by danger. And this effect was associated with a distinct pattern of brain activation known to be involved in social buffering in mammals, they added. Because of this similar mechanism, the scientists hope zebrafish can now be used as a model to study social effects on human health with suggestions that isolation can have a significant impact on conditions such as depression. But Dr Hawkins said the study also added to the growing body of evidence that fish should not be viewed as lesser animals. “I think if you are going to think it’s okay to eat any animal, then you have to realise what you are doing,” she said. She said the RSPCA did not advocate vegetarianism but operated a “welfare friendly” labelling scheme for meat and fish. “If you do choose to eat meat and fish do just be aware of what you are buying into and make sure you go for higher welfare labels and not just the cheapest,” she said. Asked if she thought fish could form friendships, Dr Hawkins said: “It depends how you define friendship. It’s not going to be analogous to human friendship. “But if you think of friendship in terms of being with another individual who you are familiar with and whose company you seek and who makes you feel positive emotions, then these are fish friendships. “It would be a good thing if these kinds of results were used, not only to improve the lives of laboratory fish, but also for people who keep fish in fish tanks to think about what they are doing when they mix unfamiliar fish together or when they split groups of fish up. “They are not just ornaments or play things for people, they are individuals, they are sentient. However she also criticised the study, saying the anaesthetic used on the fish before they were killed had been “shown to be very irritating for them”. “They will work quite hard to get out of it. There are other anaesthetics that don’t have this effect,” Dr Hawkins said. She said it was a “a bit of a tragic conflict” that the evidence “to make people sit up and think” about fish had come from a study that involved animal suffering. “The price these individuals paid in order to find this out was pretty high,” Dr Hawkins said. The zebrafish were kept in a laboratory tank and exposed to their own ‘alarm substance’, a secretion from their skin that signals danger, the researchers said in the journal Scientific Reports. If they were alone, they displayed signs of greater fear, but when they were with other zebrafish they responded more calmly. They were then killed to allow their brains to be examined. Professor Rui Oliveira, of the ISPA university in Lisbon, who led the study, said what made it significant was the discovery that zebrafish shared a similar social buffering process in the brain with humans and mammals. 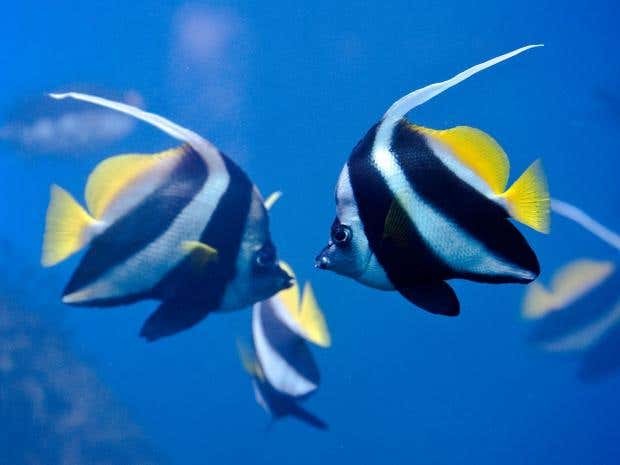 Asked about whether it should change people perceptions of fish, he said: “What this study shows is certainly they change the way they perceive their environment when others are present, which suggests they might be cognitively more complex than we originally thought. “Maybe because of that people will become more aware of their needs and welfare issues. I think if it helps, it’s great. On Dr Hawkins’ complaint about the way the zebrafish were killed, he said the anaesthetic used was part of the official protocol and he was unaware of a better alternative. His colleague, Dr Ana Faustino, stressed the zebrafish’s social support process “does not have the complexity of the social support verified in humans”.